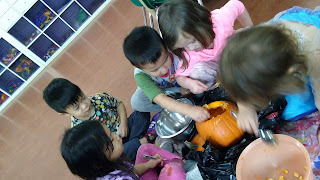 The Maple group, we explored pumpkin seeds today. 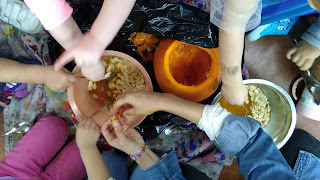 I showed some pictures to the children that I did pumpkin curving with my 8years old daughter last night. That made them some senses about curving pumpkin. Some children had never seen and touched inside of pumpkin. 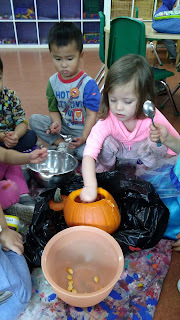 After I cut off the top, we smelled and touched the seeds and scooped them out by spoon and washed them. During lunch time, I tossed the seeds with melted butter and salt, and baked them. 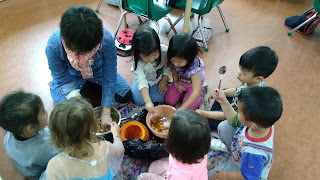 After the rest time, we tested the roasted pumpkin seeds ! 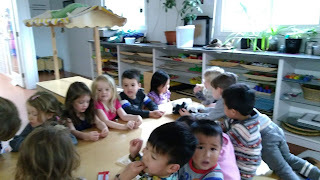 We loved them very much!!! I curved the pumpkin an owl as the children's request. 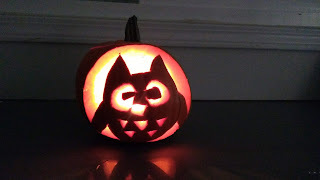 Have a happy and safe halloween !! !